Back in February I ran a bunch of performance tests of DBCC CHECKDB on SSDs, to evaluate the effects of degree-of-parallelism (DOP) and various options and traceflags, and now I’m finally getting around to presenting the results. Make sure to also read the recent post where I talk about the detrimental effect of computed-column indexes on DBCC CHECKDB performance. These two trace flags really only apply to DBCC CHECKDB when the WITH_PHYSICAL_ONLY option is used. There was no additional load running concurrently with DBCC CHECKDB. 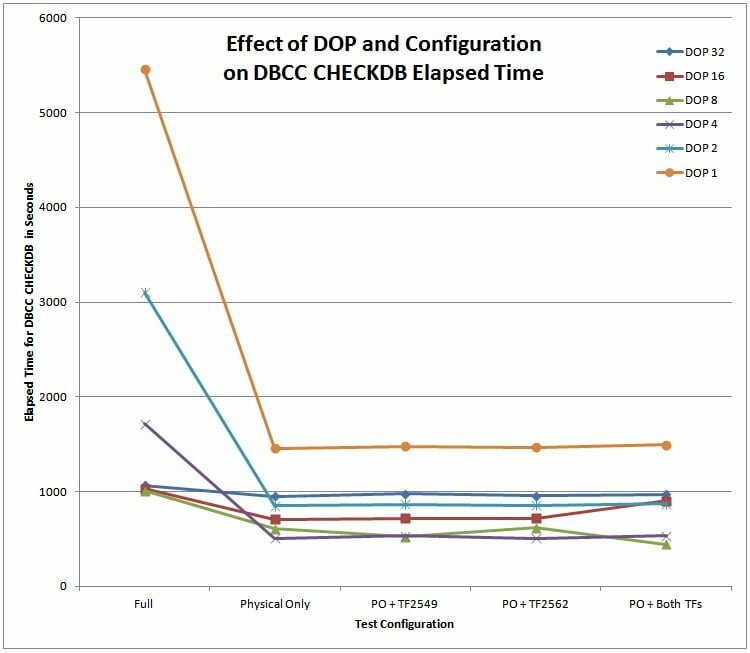 For a full DBCC CHECKDB, there is a 70-80% performance gain from DOP 1 to DOP 2, from DOP 2 to DOP 4, and from DOP 4 to DOP 8. 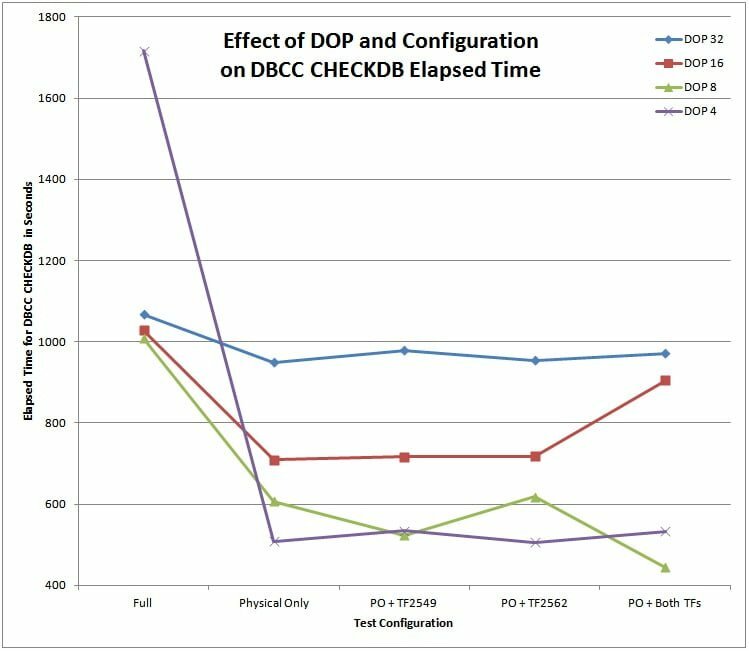 For a full DBCC CHECKDB run, there is really no scalability gain in performance for a DOP greater than 8, and in fact a slight performance degradation for higher DOPs. As you can see for the results of a full DBCC CHECKDB with DOP 8 and higher, DBCC CHECKDB on that server without I/O waits can process 0.5GB of the database per second. That’s pretty cool and is down to the fast SSDs (there were no PAGEIOLATCH_SH waits) and fast processors. Back in SQL Server 2000, our performance benchmark was about 1GB per minute. 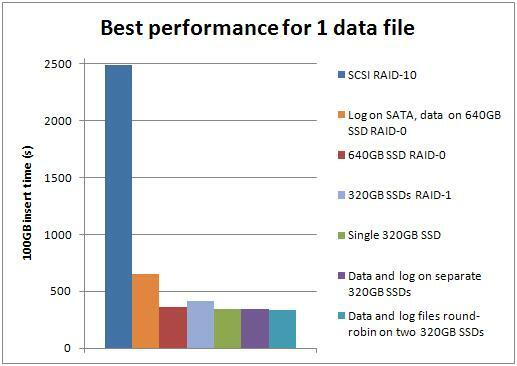 See here for some example SQL Server 2000 benchmark times that show around 3-5GB/minute, but not on SSDs. 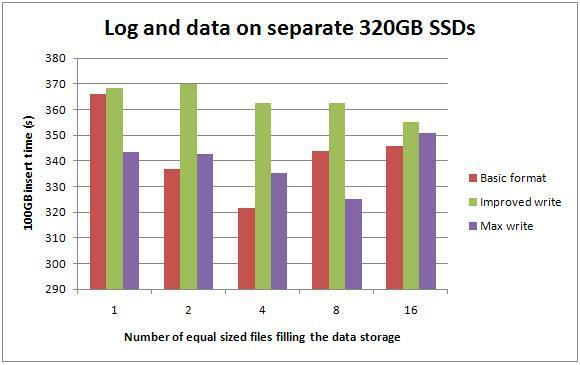 The main boost in performance when running on SSDs comes from using the WITH PHYSICAL_ONLY option. This is, of course, to be expected as it cuts out all of the logical checks that make up the bulk of the CPU usage of DBCC CHECKDB. For the scalability result running a full DBCC CHECKDB, some latch contention for structures inside DBCC CHECKDB starts to show up at DOP 8, but not enough to give zero scalability at higher DOPs. This comes from a much higher time spent waiting for CXPACKET waits, roughly doubling from DOP 8 to DOP 16, and again from DOP 16 to DOP 32. I blame the query processor for that :-) In all seriousness, I didn’t expect to see a scalability gain with DOP higher than 8, based on what I’ve seen in the past. DOP 4 seems to give the best performance overall, apart from the use of both trace flags with DOP 8. Higher DOPs get progressively worse performance. Analysis of wait and latch statistics show that this is caused by increasing amounts of latch contention at higher DOPs. The two trace flags don’t have a pronounced effect on performance in my situation. When running with a database on SSDs and very fast processors, full DBCC CHECKDB performance scales to DOP 8, and the main performance gain comes from using the WITH PHYSICAL_ONLY option. The two trace flags introduced in late 2011 don’t have a pronounced effect on PHYSICAL_ONLY performance. This is all to be expected, as the SSDs really remove the I/O component of DBCC CHECKDB performance and scalability from consideration. Although these tests are not conclusive until I’ve run similar tests on a slower I/O subsystem, I’m tempted to recommend limiting DBCC CHECKDB‘s DOP to 8 if you can (maybe using Resource Governor) to limit its resource drain on your system. I obviously also have to recommend using SSDs to vastly reduce or effectively eliminate (in my case) I/O waits. During April and May I’ll perform the same set of tests using 15k SCSI drives and also 7.2k SATA drives to see if and how the results differ. 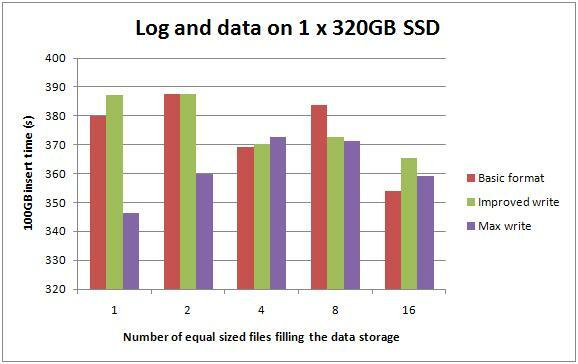 Last time I posted about SSDs I presented the findings from sequential inserts with a variety of configurations and basically concluded that SSDs do not provide a substantial gain over SCSI storage (that is not overloaded) – see this blog post for more details. You can see my benchmarking hardware setup here, with the addition of the Fusion-io ioDrive Duo 640GB drives that Fusion-io were nice enough to lend me. (For the next set of benchmarks I've just upgraded to 16GB of memory and added the second 640GB Fusion-io Duo, for a total of 1.2TB… watch this space!). 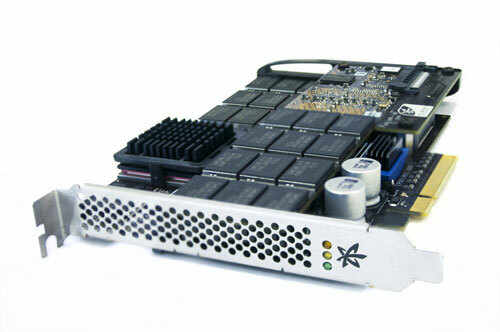 The SSD format is performed using Fusion-io's ioManager tool, with their latest publicly-released driver (1.2.7.1). Now before anyone complains, yes, this is a clustered index on a random GUID. It's the easiest way to generate random reads and writes, and is a very common design pattern out in the field (even though it performs poorly) – for my purposes it's perfect. That's a total of 19 configurations, with 5 data file layouts in each configuration – making 95 separate configurations. I ran each test 5 times and then took an average of the results – so altogether I ran 475 tests, for a cumulative test time of just less than 250 thousand seconds (2.9 days) at the end of July. Once again this shows what I've shown a few times before – on SCSI having multiple data files on the two RAID arrays gives a performance boost. The two-file case is going from a single RAID array to two RAID arrays – bound to get a performance gain – and it gets a 35% performance boost – 6 times the boost I got from messing around with multiple files for the sequential inserts case last time (see here and here for details). The best performance I could get from having data on the SCSI arrays was 1595 seconds. These numbers are showing the majority of waits are for data pages to be read into the buffer pool – random reads, and the next most prevalent wait is for log block flushes to complete. The more PAGEIOLATCH_EX waits there are, the worse the performance is. Don't let this graph fool you – the top and bottom of the scale are only 30 seconds apart. Basically moving the data files from the SCSI arrays to the RAID-0 SSD got around a 3-5x performance gain, no matter how the SSDs are formatted. The log is the obvious bottleneck in this configuration. And again – high and low values are only 25 seconds apart. Moving log off to the same SSD gave a further 45%-ish improvement across the board, with little difference according to how the SSDs were formatted. The percentages fluctuate up and down a few percent depending on write format and number of files, with the maximum write performance format tending to have a slightly higher percentage of WRITELOG waits than the other two formats. 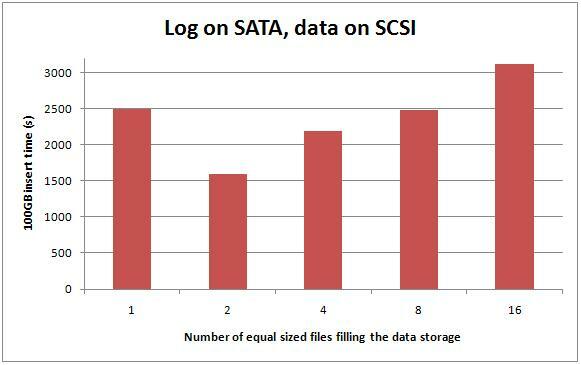 Note that moving the log to the SSD as well as the data files drastically cuts down the number of WRITELOG waits – what we'd expect. 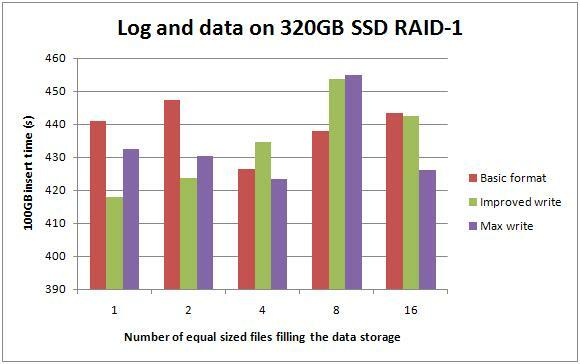 The performance numbers for having everything on a single 320GB SSD are only a tiny amount slower than those for two 320GB SSDs – which is what I'd expect. You can see that the higher amount of PAGEIOLATCH_EX waits leads to lower overall performance. This makes sense to me. Now, I have an issue with people using SSDs in RAID-0 because it's a single point of failure. In an environment that's going all out on high-availability, if I was using SSDs for performance, depending on the criticality of the data I'd want to at least double-up to RAID-1. 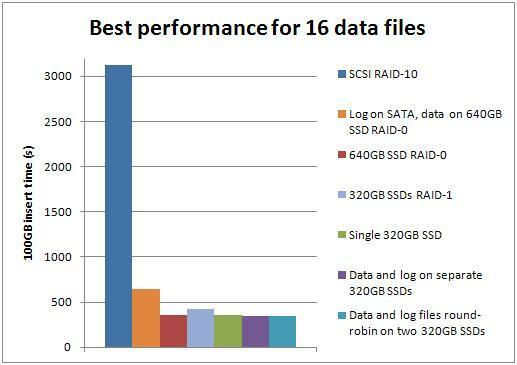 For all the various configurations, moving from a single 320GB SSD to two of them in RAID-1 resulted in no more than a 10-15% drop in performance and it's still 3-5x faster than the SCSI setup. 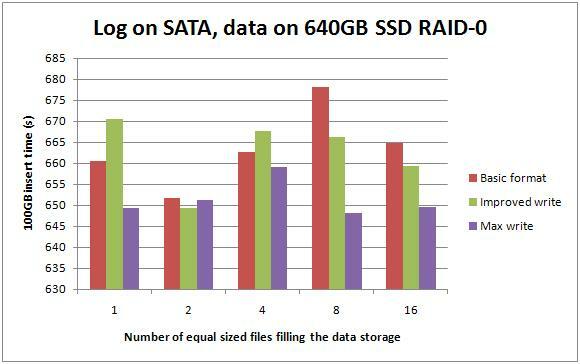 In general the RAID-1 configuration had more waits of both types than the single drive configuration. Splitting the data and log make for a 5-20% improvement over having everything on a single 320GB SSD. The wait stats for these configurations show the same trends that we've seen so far – slightly slower performance = slightly more PAGEIOLATCH_EX waits. This confused me – the single file case is exactly the same configuration as the test case above, but the results (for each test being run 5 time and then averaged) were almost 10% faster for the first two formats. No significant differences for the other configurations. 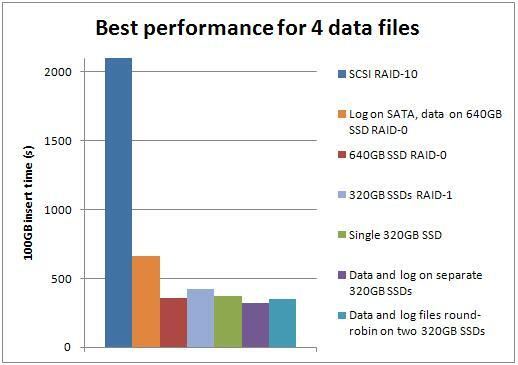 The configuration of 4 data files on one SSD and the log on the other SSD, with basic format for both, was the best overall performer, beating the best SCSI configuration (2 data files) by a factor of 4.96. Reminder: this test was 32 million inserts with no reads or updates (i.e. no random IO). It is very important to consider the limited scenario being tested and to draw appropriate conclusions. 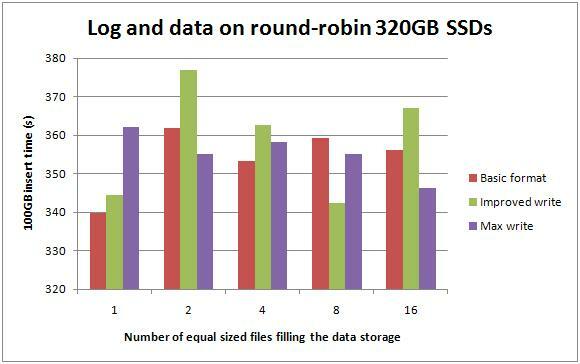 For a random read+write workload, the method of formatting the Fusion-io drives doesn't make much difference. I'd go for the basic format to get the higher capacity, but I'd always to a representative load test to make sure. Compared to the sequential insert workload that I benchmarked in the previous set of tests, the random read+write workload makes it worth investigating the investment of moving to SSDs. 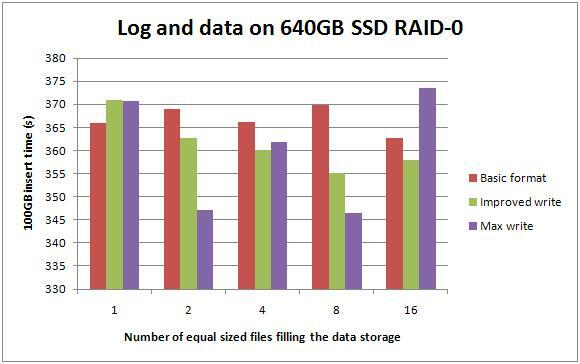 Just like last time, these results confirm what I'd heard anecdotally – random operations are the sweet-spot for SSDs. Brent's playing with the server over the next 4 weeks so I won't be doing any more benchmarking until mid-September at least. Hope these results are interesting to you!